Summer lovin' is in the air as two quick service restaurants feel the heat in each other's kitchens and create a recipe for love on social media. When competing brands engage with each other on Twitter, it’s usually in the form of a burn or used as an opportunity to brag about a better deal they are giving consumers. 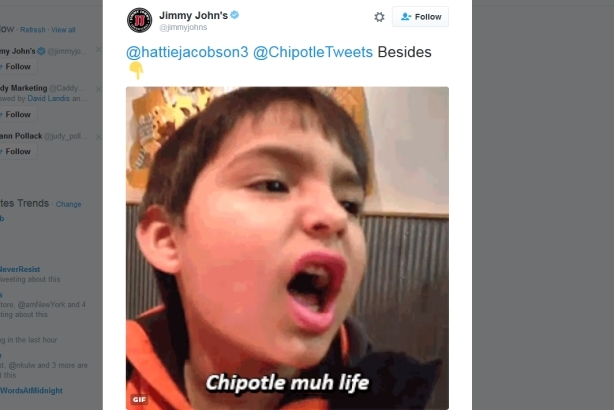 But on Wednesday, Chipotle and Jimmy John’s used the social media platform to basically profess their love for one another – multiple times throughout the day. It all started when a Twitter user posted that she couldn’t decide whether to eat at Chipotle or Jimmy John’s. @BaileighLaipply @ChipotleTweets Why limit yourself, get both! Other people started tweeting about the same dilemma they were having, and both chains responded, telling them to alternate lunch plans between the two restaurants. One Twitter user said she wanted a relationship like Chipotle and Jimmy John’s has. And if this wasn’t enough proof there is a romance brewing between the chains, Chipotle even asked Jimmy John’s: "Are you feeling freaky?" We’ll be staying tuned to see how this love story progresses.